After taking the cricketing arena by storm, is Hasan Ali all set to enter the field of entertainment? Have we heard right about the cricketer’ new job? 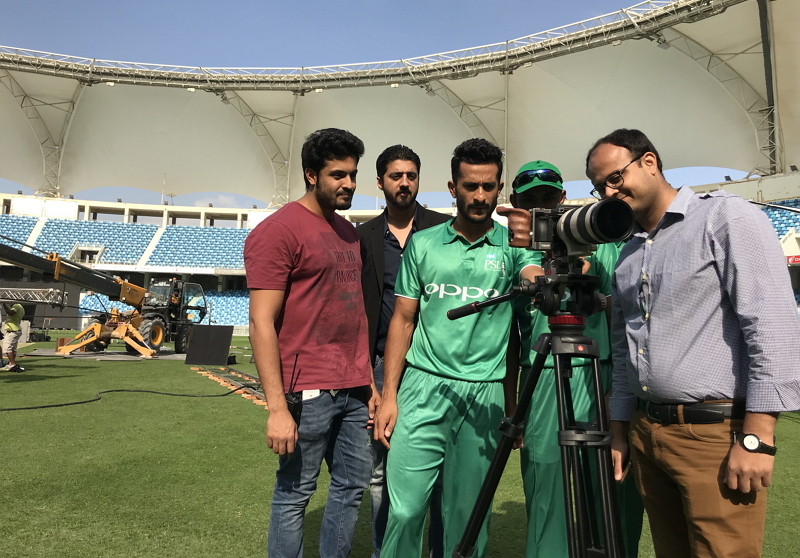 We caught Hasan Ali, Pakistan’s pace bowler who has quickly become a key player for Pakistan cricket team since 2017, dabbling behind the cameras. The shared pictures show Hasan Ali in directorial poses at Dubai Stadium and are building up intense curiosity among his fans who are finding it hard to control their inquisitiveness. The guessing game is going strong as we, his super fans, try to find out #WhatisHasanUpto? Hasan Ali has been having a phenomenal time because of his triumphant achievements that he achieved in 2017 with some winning spells played amid the Champions Trophy. Hasan Ali is a medium-fast bowler with a rocking bowling alley action and a mix of variations. Hasan Ali has been included in different undertakings before, and coming across these intriguing pictures, we are certain that he is engaged with an interesting project. That makes us wonder, what is this new venture he is busy with? Is it true that he is starring in a movie or making proper acquaintance with showbiz? Does Hasan have a hidden talent that we as his fans are unaware of? We have so much to inquire. “Lights, Camera, Action! Hasan Ali seen meeting with some new directors, is he directing a new movie?